I put in on the Des Plaines River just up stream of Rt 83. I paddled up the Des Plaines to Ogden Av. I portage down Ogden Av about .9 miles stopping at a restaurant for lunch. With the lunch detour and looking for a put in my GPS track for the carry was 1.2 miles. Once back on the river is where some of the best paddling started. A short distance up stream is where the Salt creek comes in. This section of the creek is winding with many stretches not having any structures with in view of the creek. The creek slowly gets shallower as you go up stream. I don't think I dragged bottom until past Brook Field Zoo. WARNING: There is a large Concrete structure on the North side of the creek with water pouring over the edge into a abyss (deep tunnel I think). There is no protection on it you could be pulled in by the current. I made it to Grau Mille at around 7:30PM. The last few hours involved a lot of getting out and dragging past shallow spots or other obstructions. A little over 22 miles and more than 9 hours for the trip. It is hard to place where the creek got shallow but I think from Lagrange road down stream was good going. There is a place to get off the Des Plaines just down stream of where the Salt Creek enters the Des Plaines. It would be better to go down stream as the current was a strong factor. Most people would enjoy do all of or the lower part of Salt Creek but doing this entire trip up stream was a challenge. The current is stiff enough it would be better to do the trip down stream. 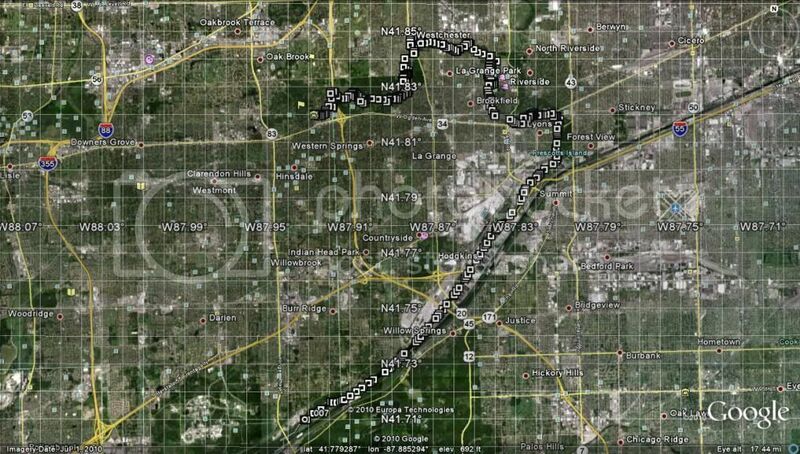 I used Google Earth to locate the best area to start the portage.